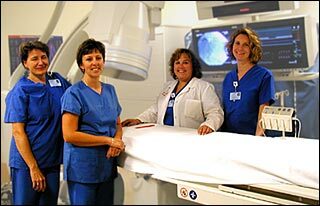 The most advanced Siemens cardiac catheterization equipment and a team of cardiologists, cardiac nurses, and technologists come together to benefit our patients. Cardiac catheterization allows the doctor to collect information needed to identify heart problems and to determine the best course of treatment. Cardiac Catheterization has become a common diagnostic test to detect and identify coronary artery disease. By having this test done your doctor is able to collect the information he/she needs in identifying and determining the best course of treatment for your specific heart condition.